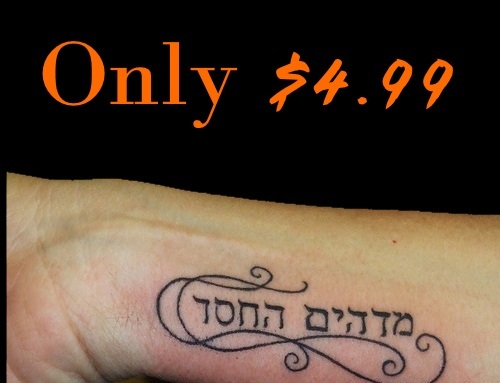 Hebrew Tattoo Translation FREE - TattooTranslate: Why Get a Tattoo in Hebrew? Firstly tattoos are forbidden in Judaism (Leviticus 19:28) so the use of Hebrew script in tattoos can’t be for Jewish religious reasons, however there is an explanation as to why so many people choose tattoos with Hebrew letters, Hebrew verses and tattoos of Hebrew words. Having a tattoo in a foreign language lends a certain amount of mystery to the tattoo, people will always be wondering what it says. This may explain why in Israel – where people understand Hebrew – it is more common to find tattoos in Chinese than in Hebrew. Not only the fact that others need to stop and ask what the tattoo means but also that the foreign language in question is an ancient one. Being one of the ancient languages Hebrew brings with it a complex and expansive history. Just the look of the Hebrew tattoo script conjures up images of Biblical forefathers, Israel, a time of miracles, Jesus, Kabbalah and even the suffering during the Holocaust. In short the appearance of Hebrew letters is charged with cultural and spiritual emotions and a universal western experience. So if it is the fact that Hebrew is an ancient language that causes people to get Hebrew tattoos then why have Aramaic, Sanskrit, Akkadian, Atakapa, Adia or other ancient languages not become popular tattoo languages? Perhaps because although Hebrew is an ancient language it is not extinct. With some people (about 7 million) being able to read Hebrew the tattoo can be understood, explained and read by some. The mystic side of Judaism is the inspiration for many Hebrew tattoos. A Kabbalah tattoo often includes one of the 72 names of G-d used in the Bible. Each name is associated with a particular divine quality. Another popular Kabbalah tattoo – the tree of life also is attributed with many meanings and mystic significance. The Kabbalah tattoo of a red string is said to protect against evil. In this way choosing a Kabbalah tattoo in Hebrew packs in more meaning than an English phrase could. A Hebrew tattoo expresses your deep spirituality. Hebrew letters also have a numerical value, in fact Haradi religious Jews use the Hebrew letters to count with daily (instead of 1, 2, 3, they count aleph, bet, gemal) so when you get a Hebrew tattoo the letters you choose will have another level of meaning as each number also carries with it significance. Hebrew is also the original language of the Old Testament so there is religious significance. If a tattoo is going to quote a Biblical passage than it might as well be in the original language. Being the language of the Bible Hebrew also is considered “G-d’s language” and a spiritual language. The original Biblical Hebrew is extremely poetic, more so perhaps than English. Putting ink to skin with a Biblical praise in Hebrew is a permanent commitment to the phrase’s meaning and an outward expression of inner beliefs. Hebrew script is aesthetic in appearance in the same way that Chinese, Arabic, Japanese and Hindi scripts are, in fact even if you don’t understand the meaning of the tattoo words you’ll admire the curves and swirls of the script. The use of Hebrew letters and Hebrew script in Tattoos is rather ironic on one hand people are trying to be more spiritual and give their tattoo mystic significance and on the other hand tattoos are completely taboo in the Jewish religion. If you’re still convinced that you want a tattoo in Hebrew then at least make sure you get it done by a professional, and checked by a Hebrew speaker for accuracy before you put ink to skin.